The basis of chiropractic involves performing an adjustment of the spine. This is a gentle force given to the vertebrae that allows it to move properly and facilitate proper neurological function and healing. There are many different ways to adjust the spine, and we are proficient in several of them ranging from diversified manual adjustments to instrument adjusting (Activator) to using a specialized table (Thompson). 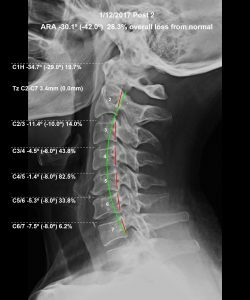 The style of adjusting is typically determined by the patient-either what the doctor thinks might be the most effective but as importantly-what the patient prefers! We adjust people not just spines! We also believe in giving you, the patient, OPTIONS! We can help you by dealing solely with the symptomatic portion of your health, something we call “Symptom Care.” But we can also help you with the root cause of your problem – your POSTURE! We call this “Remodeling Care.” It is an approach that involves addressing the whole picture. We put you squarely in the driver’s seat and allow you to dictate the level of wellness you want to pursue. Our role is solely to facilitate the process once care is chosen. We have outlined Symptom Care and Remodeling Care in more detail for you below. General chiropractic care over a period of 2-4 weeks designed to provide relief of symptoms and improve the flexibility/mobility of spinal joints. 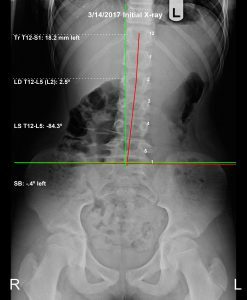 Symptom Care does not provide long-standing correction to spinal problems and posture. However, it is often a viable alternative to drugs and at times even surgery for pain relief related to structure. This cutting-edge form of chiropractic care is a spinal rehabilitative program designed to improve or correct underlying structural problems and abnormal posture. This is a more comprehensive approach resulting in long-term benefits. 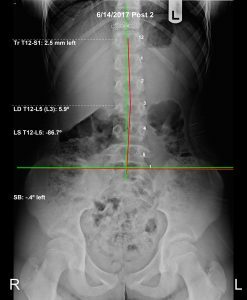 Comparative x-rays are taken to objectively measure patient progress toward normal alignment, allowing them to SEE their health improvements Remodeling care is followed by routine maintenance adjustments to help hold these changes in place. 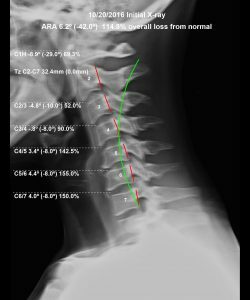 After completing a thorough examination, a posture and x-ray analysis is performed. This is a critical component of the initial patient visit and helps to determine if the patient is a candidate for care at Leahy Chiropractic. This involves a series of adjustments to help improve joint muscle, reduce muscle spasms, and decreased pain. Once the patient is feeling better and it is appropriate, the third stage of care begins. Based upon the posture and x-ray analysis, specific MIRROR-IMAGE© exercises are prescribed to the patient to facilitate structural correction and to retrain the muscles supporting the body. This helps to bring balance to your spine and is different than exercises typically performed at the gym. Because ligaments and muscles actually adapt and change shape as a result of poor posture and alignment, a sustained level of force, always within the tolerance of each individual patient, is crucial in making long-term, positive changes. Unlike medical traction, which pulls apart joints to provide brief relief only, this specific form of chiropractic biomechanical traction involves applying a sustained force to the spine in order to restore normal spinal alignment. Much like braces correct crooked teeth, traction is designed to move the spine to a more normal position over time. One of the most important aspects of this care is education! If you are not shown proper posture, habits, etc how can we expect to have long term results?! With remodeling care, we emphasize giving our patient’s an “owner’s manual” to really be able to help them take care of themselves for the long haul. We want you to be healthier 10 years from now than you are today. New Patients are seen outside the listed hours.